SENATOR OMOAGEGE AS URHOBO VOICE. Urhobo is reputed as the fifth largest ethnic nationality in the Nigerian federal structure. The contributions of the Urhobos to development of Nigeria remain unassailable. The indelible marks of this lively and vibrant ethnic group are forever etched in enterprise, politics, law, media, education, economy, culture, agriculture etc. One man that embodies the salutary impact of the Urhobos is distinguished Senator Ovie OmoAgege. He stands today as the only and original voice of Urhobo at the National Assembly. The official mascot of Urhobo identity, history, traditional norms and values. This admirable personae is rooted in his pedigree. After graduating with excellent grades in law at Nigeria’s most sought after university, UNIBEN in 1985, he went higher in 2002 to obtain an LLM (masters of law) degree in Tulane university, United States of America, rated among the top 20 universities in the world. A distinguished academic orientation that prepared him for a dignified future. The ascendancy of OmoAgege is meteoric as the fabled Northern Star. Before his grand arrival to the hallowed chambers of the Senate, OmoAgege had emerged as a political leader of promise in Delta. It is no surprise that he took a memorable flight from this tutelage into the political hierarchy of Delta state, serving as Executive Assistant and then civil commissioner under the Ibori Administration in 2005. He rose to become secretary to the state government, the youngest ever, setting a trail blazing direction, through service of purpose and vision. In terms of experience in governance, Omo-Agege easily takes the piece of cake. He has the matchless competence, commitment and character to speak for the Urhobos. His track record at the National Assembly is phenomenal. He never emerged in the scene as a ranking Senator but his achievements so far are as towering as they are humbling. Buoyed by a desire to ensure sanity in Nigeria’s highly corrupt and morally decadent tertiary institutions, OmoAgege initiated a bill on sexual harassment to check the excesses of randy lecturers. He moved to ensure that the Federal University of Petroleum Resources located in Ugbomro, Urhobo heartland got the desired legal backing from the Federal government. Having foresight, he knew that without full legal backing, the great institution could be negatively affected in the near future. Today, FUPRE stands as one of the most sought after University in Nigeria with improved infrastructure and sound legal footing. 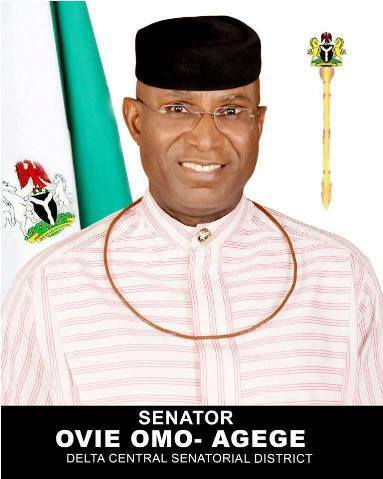 Thanks to the patriotism and selfless dedication of Ovie Omo-Agege. Concerned about the irregularities that mar most elections in Nigeria, having experience as a victim, OmoAgege co-championed the Independent National Electoral Commission, INEC Amendment Bill with Senator Abubakar Kyari from Borno State. The National Industrial Court amendment bill which seeks to give litigants rights to appeal decisions of the court which hitherto blocked all appellate rights whether they found judgments fair or not. The Bill for an Act to amend the Court of Appeal Act of 1976. This is sequel to that of the Industrial Court. It opens up opportunity for appellants from the Industrial Court who did not find satisfaction from its judgments. The Court of Appeal, by this bill, can adjudicate on cases from the National Industrial Court. OmoAgege vibrantly provoked deep thinking with The Dormant Accounts Bill which he championed at the Red Chambers. The Bills seeks to know what happens to funds in dormant accounts and how they can be used to deliver good governance to the common man. He is also relentlessly working with relevant stakeholders to resuscitate Delta Steel Company which has suffered abject neglect by successive administration’s. The vibrant and vocal sojourn of Ovie OmoAgege has also stirred the Federal government to undertake a massive rehabilitation of Eku-Sapele road in Delta Central. A high power federal delegation led by the Minister of Works, Babatunde Fashola and Senator Ovie OmoAgege were on ground recently to inspect the progress of work which has reached an advanced stage. All these and more are the eloquent testimonies of Ovie OmoAgege’s footprints barely one year at the National Assembly. What drives OmoAgege’s political philosophy is populism. A leader passionately in love with his people. A leader fiercely loved by his people. Lover of widows. The lawyer son of a Judge has the highest number of legislative aides among the three Senators in Delta State. This is not because he has the money but because of his accommodating spirit which seeks to empower many if not all. Though Urhobo by origin, Omo-Agege does not have the all too familiar tribal marks of nepotism, sectionalism and self centered clannishness, common with the typical Nigerian politician . He is averse to egocentric mindset. He is not persuaded by a narrow world view. His contacts and company transcends tribal, religious and political boundaries. He portrays the Urhobos as being tolerant and hospitable. This is evident in the way he relates with people. As a matter of fact, one of his aides is Ibo, not even from Delta. The adventure of OmoAgege in politics is an epic tale of service and sacrifice. A true model of Nigerian nascent democracy. Ijeoma Uba writes from Asaba.